Thomas E. Wenzlau ’50, Ohio Wesleyan University’s 12th president, died Aug. 1 in Colorado Springs, Colo. He was 91. His beloved wife of 68 years, Nancy Allen Wenzlau ’50, preceded him in death June 9. She was 89. Tom received his Bachelor of Arts degree from OWU with honors. He also was elected to Phi Beta Kappa, served as president of the Sigma Alpha Epsilon fraternity, and lettered in football, basketball, and track. In 1972, he was inducted into the Battling Bishop Athletic Hall of Fame. He received his master’s and doctor’s degrees from the University of Illinois. Tom taught at Wesleyan University, Kenyon College, and Lawrence University, where he chaired the Economics Department. He also spent a year as a Fulbright lecturer in Pakistan. During his time as president of OWU from 1969 to 1984, the $33.5 million XIVth Decade development program was begun and successfully completed. Major construction projects included the Chappelear Drama Center, the Branch Rickey Physical Education Center, the expansion and remodeling of Sanborn Hall, and the magnificent Rexford Keller Memorial Concert Organ in a remodeled Gray Chapel. In addition, major advances were made in campus computing capabilities. Nancy majored in English and later taught the subject. She was a member of the Kappa Alpha Theta sorority and was involved in the Young Women’s Christian Association, Le Bijou yearbook, varsity swimming, and Twin-W (varsity club for women). During her 15 years as Ohio Wesleyan’s first lady, she made many friends through her generous hospitality, support, and involvement in a variety of projects, including efforts to improve the president’s house and to preserve Monnett Hall memorabilia. She had an extensive family history at OWU, including mother and various aunts, uncles, and cousins. The Wenzlaus are survived by their daughters, Kathy Wenzlau Comer ’76 and Janet Wenzlau Von Kraut; sons David and Scott Wenzlau; and four grandchildren. 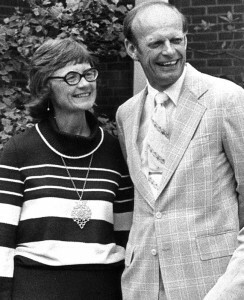 Contributions in their memory may be made to the Nancy Allen Wenzlau ’50 and Thomas E. Wenzlau ’50 Scholarship Fund or any other need-based scholarship fund at OWU.